Project Description: Standard sized double sided business card that has a good feel in the hand and visually appealing presentation. EnergX approached us with a very simple premise for their project. 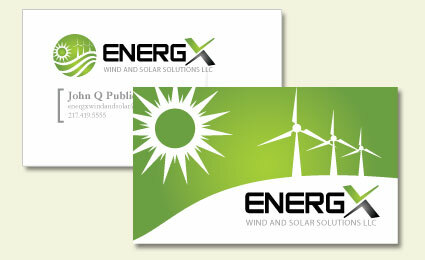 They wanted to take their logo and expand on the idea to turn it look and feel into a business card that would convey to any potential customer that EnergX is a top end company that takes the customer experience just as seriously as they do wind and solar solutions. The strong logo made this project a delight to deal with. With so many great graphical elements already in play, the ideas practically jumped off the sketch pad at us as we were having our project kick off meeting. Weeding through the ideas, the design team came up with a very strong design pitch for EnergX that they enjoy before we even had a chance to explain our thought process behind the design. With the inital design approved, it was a quick turn around to get each of the three individual business cards designed, approved and printed using our printing contacts.